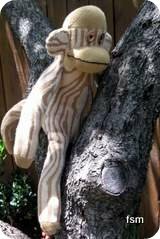 Sock Monkey Doll Made With Wooden Socks!! 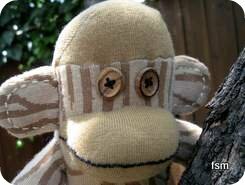 OK, the sock monkey doll itself is not wooden, it's just made with novelty wooden pattern socks. 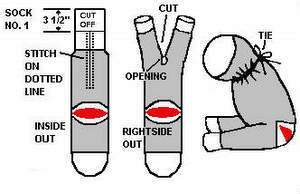 These Ashi Dashi socks are nice work with and are really good quality, this sock dolls going to last for eons. 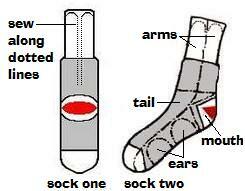 Step one: You will need Ashi Dashi Woodgrain socks. 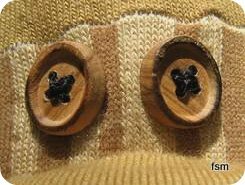 Eyes: Two wooden buttons were attached for the monkeys eyes. Ears: The ears were slightly stuffed, then embroidered with cream thread, be sure to not pull the thread too tight or it will start to gather. 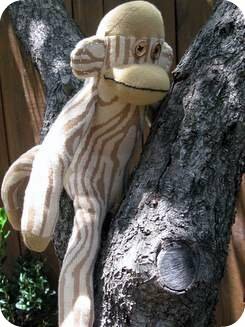 When you buy socks to make monkeys, look for good quality socks, it's well worth spending a little extra money to make a sock animal that will last for years. Novelty socks are great as there are so many fantastic patterns to chose from but don't overlook sturdy work socks, especially the Original Rockford Red Heel Socks. TIP: Sticking with a theme keeps everything cohesive. 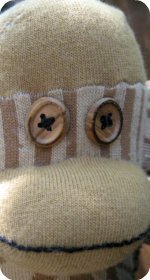 As shown on this page the sock monkey was made with wooden pattern socks and wooden buttons were used for the eyes. Another example is the yellow flower sock monkey toy made with knee high socks that have flowers on them, and yellow flower button eyes were used.